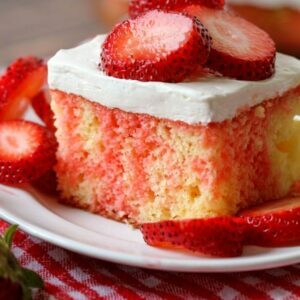 This Strawberry Shortcake Poke Cake is the perfect cool and refreshing dessert. Yellow cake with strawberry gelatin poked throughout, topped with a delicious whipped topping and fresh strawberries. 1 small box instant strawberry JELL-O Raspberry or cherry work too! Make Yellow Cake by following directions on box. Once the cake is out, take a fork and poke it all over. While cake is still warm, make jell-o by adding mix to 1 cup hot water and dissolving and then adding 1 cup cold water. Spoon this liquid over the top of the cake, making sure it goes through the holes made by the fork. Refrigerate for 4 hours. When ready to serve make frosting by mixing cream cheese, and powdered sugar in a medium bowl. Add vanilla. Mix to well combined. Fold in Cool Whip. Spread over cake. Spread sliced strawberries over the frosting or add individually to each cake square. ENJOY!